A lot of new writers can’t believe how much money you can make writing for small businesses or online clients. Mom blogger? 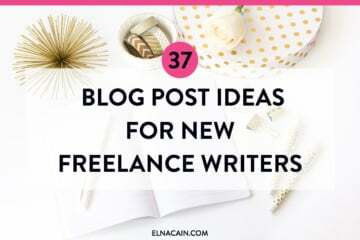 You can be a freelance writer and make some cash with your blog posts. Bank teller? Burnt-out corporate advisor? Clerk? Librarian? Yes, you also can be a freelance writer full-time or part-time (like me!). No matter your background, if you like to write and are willing to learn to write better, you can succeed as a freelance writer. But, there’s more to being an online content writer than being able to write. Online content is special if you don’t realize that already. When you read a blog post, it’s much more different than reading a page out of a book or your morning newspaper article. And if you want to be a freelance writer online, you need to know what clients want. Typically, it’s valuable content that can help them grow their business in some way. And when you can deliver that type of content to your clients, whoa! YOUR VALUE goes way up too. What Do I Mean By Valuable Content? I asked my subscribers to show me their website or blog. I had a blast looking at their portfolios and blogs. But, I noticed a commonality with many of these samples. A lot of them didn’t provide enough value to their writing. What do I mean by this? Have you ever read one of Jon Morrow’s blog posts? He’s able to get you hooked within the first sentence. Jon uses bucket brigades, which is a copywriting technique and something I use all the time. By adding an ellipse or colon or something abrupt as the first sentence, it compels you to keep reading. This is engaging. It tells a story that you want to finish. One of my pet peeves is seeing a blog post that isn’t properly formatted. 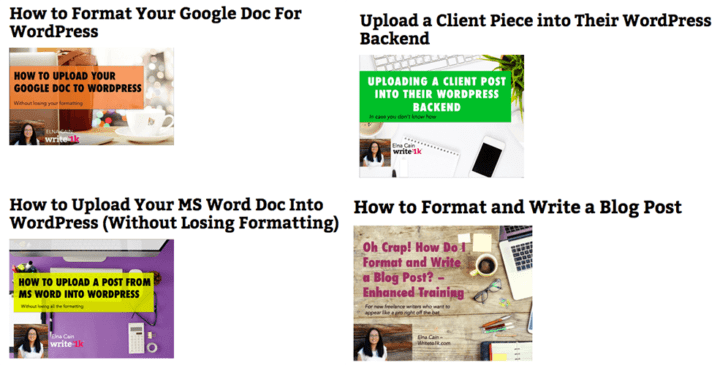 In my Writeto1k course, I created lessons and multiple videos showing your exactly how to format your posts properly. Why do I have these resources in my course? Because I know it’s probably the #1 way a client knows you are a legit freelance writer. Remember, prospects go to your writer website, click on your portfolio and then hopefully click on a sample piece. They can immediately tell if you are a good online content writer by how your content looks like. This turns your sentence into a valuable sentence. When a client gets a piece of content that is filled with high-value, they’re going to keep you as a writer, no matter what you cost. I have a client that enjoys my digital marketing content. They enjoy it so much that they’ve offered me bigger projects like creating course material or product reviews. For a while, I was turning them down because I’m too busy and at this moment in time and it’s easier for me to write blog posts than an entire course curriculum. I was sure that because I turned these big projects down (and this client kept coming back to me about more projects), I was sure they wouldn’t use me anymore. I mean this is classic “difficult writer” territory and who wants to work with THAT type of writer (uh, I’m sorry but I just can’t take on such a huge project right now….While this project does look fun and exciting to be a part of, at this time I just cannot devote any time to it.)? But, you know what? This client understood my position and continued to offer me blog writing projects instead. Why? Because of the immense value I create for them with my writing. They don’t want to lose me! Now, I’m not sharing this to boast or anything like that. I’m sharing this story to drive home how important it is to provide high-value content for your clients. When you do, your income will soar. Why? Posts like those I just mention require a lot of research to convey your point across. The time it takes for you to research and write these types of posts takes much longer than to come up with five ways to enjoy the fall when you have kids. Because of that, you can increase your rate for these in-depth posts. The title alone should help you realize that this is a monster of a post and highly comprehensive. David goes into detail about each email service provider and tells you how each one works and is different from the others. David’s blog is filled with content that clients would totally love for their blog. So, you can see how he’s using his blog to land more clients based on the quality of writing he’s putting on his own blog. Do you think he has low-paying clients after seeing his posts online and his blog? Part of a client’s content marketing strategy is to provide helpful posts for their audience. They not only want to acquire leads with their blog, but they also want to inform visitors and convince them to follow their brand. I mean, why do you visit blogs in the first place? Probably to learn something or to solve a problem you’ve been having. My blog is positioned to help new freelance writers get a handle on freelance writing. I want to provide the best free content to help you get started because that’s what I ultimately want – to help new writers find direction. Sure, I would be thrilled if they enrolled in my course, but I’m still happy if they can land a client using what’s on my blog or in my free courses. When you can show that your writing helps people, they are more inclined to keep you and understand the value you have for their business and their blog. 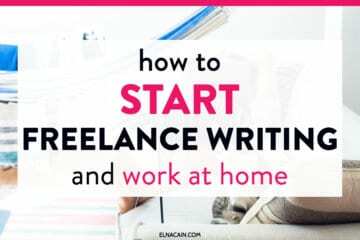 Ready to Be a Successful Freelance Writer? If you’re struggling to land more consistent work or higher-paying work, look at your content and see if you are providing something that’s valuable. If you aren’t, it’s time to change that. When you do, I’m pretty sure you’ll catch the eyes of higher-paying clients. Let me know how you’re going to change your writing! If you’re ready to really earn a living from writing, you can get your step-by-step profitable freelance writing blueprint by joining Write Your Way to Your First $1k. It walks you through the exact action steps you need to take to land clients, tweak your website to increase conversions and get paid to write in just weeks or less. Great article, as per usual, Elna. Engagement is a great way to prove to your prospective clients that you are worth the money you are asking from them. I say, the longer the post, the better! That’s why it’s so hard for me when a client asks for a blog post that is less than 800 words. (And yes, I’ve had a client ask for that recently. SO.HARD.) I like the articles where I can go really in-depth about my niche of choice (mental health) and can really help people by engaging them in the post. Thank you for putting a fire under my rear end to keep this determination going! Thank you so much. And yes, we are a business and we should work every day to deliver top notch stellar service. Take that time to learn! 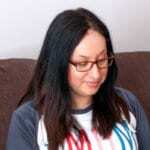 I’ve always submitted guest posts stuffed with optimised images, the correct formatting and SEO tags attached, and I never thought to actually highlight the fact that I do that until Jessica Mehring told me I should make it part of my offer! It’s a good differentiating factor. I’m quite glad I started blogging in 2009 because I learned all of the ‘how to write online content’ lessons on my own blog before I started pitching to clients, and now I’m just struggling with turning my blog into something that can help me land clients…but part of it is just deciding on a direction because I want it to be valuable to the right people! Yes turning your blog into a lead generation tool can be a challenge for some. I think your copy was to speak to your target buyer and your site has to be easy to navigate! What a great topic! 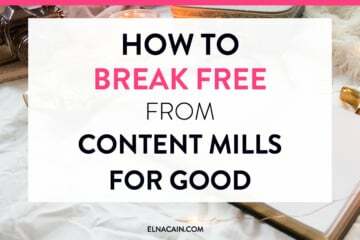 I guarantee that adding value to your content helps your readers and your clients. That doesn’t mean writing loads of words just for the sake of it. I think the point you make about researching in-depth posts is often overlooked. It takes time to research topics as well as writing about them, so you have to factor that into your pricing. 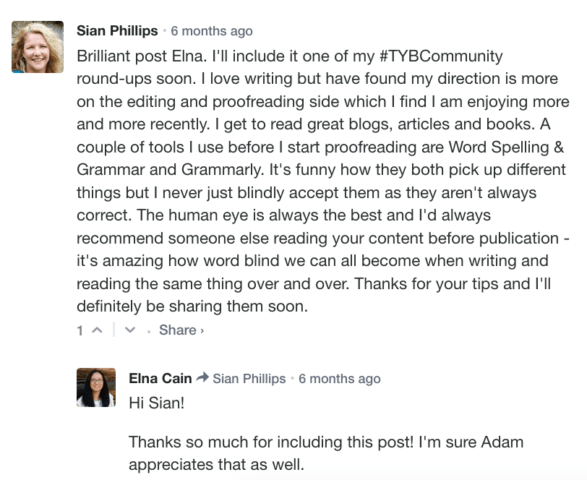 Thanks for including my blog post for Blogging Wizard as an example, Elna. Your GUEST POST is totally packed with value. 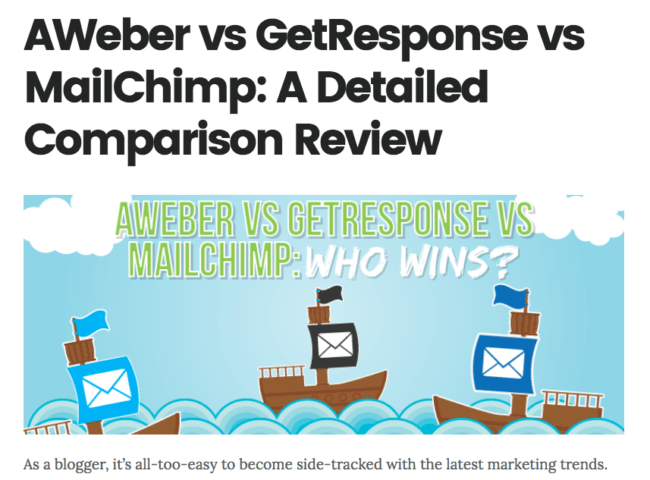 I admit, I don’t typically punch that much value in my guest posts. Maybe if I had more time!! I do have a full client load and twins to take care of. You’re right; just writing a bunch of words doesn’t make it valuable. Learning how to craft your copy so that what you’re saying is easy to read and understand and isn’t fluffy. And yes, you do have to factor that research into your pricing! Content generation isn’t so easy for the starters. Nowadays, people are trying to become freelance writers. They are trying the meaning of a valuable content. The visual content always helps and they should give it a try. The more engaging and detailed content always works. The value you add to the content can be improved with the above-mentioned ways. You’re right. I understand that new freelance writers may not know about how to boost their content with valuable writing. That’s why I wrote this post to help them understand that simply adding value to your writing increases YOUR value.